Which came first: the original students admitted to the Medical School or the first graduates? If you said graduates then you must be paying attention. In the past I’ve discussed how the original requirements for admission to the Medical School (then known as the Department of Medicine) where formulated in April of 1888 with the first class entering in October of that same year. Prior to that, the College of Medicine consisted of faculty members that served as an examination body that recommended candidates to the Board of Regents to receive a Bachelor of Medicine or M.D. It did not provide instruction, rather it assessed all candidates on their scientific and professional skills. The first graduates earned their degrees in 1884. Four years before the first entering class. Those graduates were James Simpson and Hugo Speier. The following is a partial list of examination questions they faced in 1884. Give Chemical composition and microscopic structure of bone. Give boundaries of the Fourth Ventricle. Fats: Variations and use in the economy. Protein compounds: Characteristics and ultimate destination. Describe the symptoms of poisoning by oxalic acid. (a) Mention the antidote or antidotes for oxalic acid, with an explanation of their actions. (b) How is oxalic acid liable to be taken by mistake? What condition of the brain would you expect to find in a case of death from acute alcoholic poisoning? What is Cancer? Describe its varieties. What do you understand by Preventive Medicine as distinct from public or private hygiene? Give an illustration. Name the dangers to health most likely to occur in the house of a farmer or in a private house in towns or cities. State how you would search for them and how prevent or remedy them. How should a punctured fracture of the skull be treated? For what injuries and diseases is amputation generally performed? Is there a distinction between functional and structural diseases? If so, give a definition of each kind and illustrate by example. What is Meningitis and what are its results? Give anatomy of the Uterus. Give differential diagnosis of scarlitina and measles. 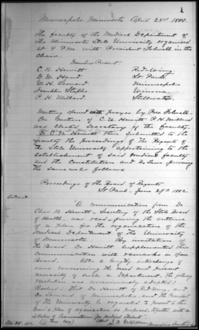 Read the faculty minutes for the College of Medicine from 1883-1886 and see the full set of examination questions (pages 21-28) below. Archivists can spend a lot of time thinking about what goes into a box. Whatever document, report, letter, memo, etc. placed inside immediately earns an institutional commitment to its long-term preservation. Who knew going into a box was such a privileged position? At other times, archivists hear the perennial call to think outside the box, which is an ironic metaphor for a profession that cannot stop thinking about the inside of the box. One recent visitor to the archives dryly noted that even our boxes come in boxes. And, as if to add insult to injury, for five years this archivist lived next door to a traveling box salesman. It seems we cannot escape the box. And then there are those rare moments when we must think of the box, not as a storage device, but as part of our history. Such is the case with this copper container that was once the time capsule located inside Jackson Hall. Sealed and placed in the cornerstone of the new anatomy building on September 5, 1911, this box contained local newspapers, University of Minnesota photos, reports, Masonic publications, Cass Gilbert plans for south of Washington Avenue as well as a letter written by Dr. Thomas Lee, then Director of Anatomy, which accompanied the items. Opened in January 2005 to much fanfare, this box and its contents continue to attract attention and commemoration. 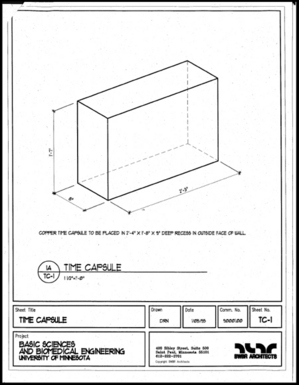 The most recent box variation presenting itself in the archives is a drawing of a box that is stored safely inside an archival box. This is an architect’s design of the copper time capsule placed inside the walls of Basic Sciences, now Hasselmo Hall. Once opened, perhaps this copper box and its contents can join its architectural rendering in the archives for their long-term preservation. Time and time again, the commitment to the archival box seems to outlast the guarantee of brick and mortar.